It has been a while sine I have updated anything on this blog. Between family, dogs and the making of equipment I've been far too busy to post anything here. I have however, taken photos along the way. We have since added two new pups to the group form Iqaluit. These pups were born on the same day as each other from different mothers on the same team. They are genetically unique from one another but act as brother and sister. Also, conveniently they are only three days younger than our other pups, making them an ideal fit. Their names are Kajuk and Misty. I've also been busy making some new equipment. I've eye spliced a bunch of lengths of three strand twist (for use as traces) and made uqsiit for the sled side of the lines. More harnesses have been sewed to fit the pups and a whole bunch of sanniruujait have been made for existing harnesses as well as new ones. I also built a 14' qamutik with 24" napuiit. 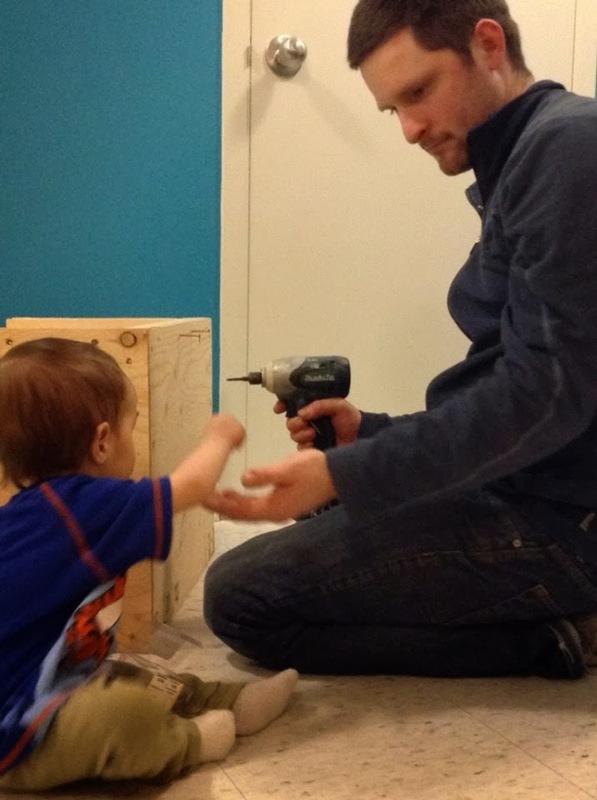 After building the qamutik my one year old son helped me assemble the box that mounts on the front of it. This front mounting box is real Nunavik style. I had decided I was going to go this route mostly out of tradition without realizing it's unique benefits. Prior to building the box I had used the qamutik without it. On ice it really doesn't matter where the box is mounted or if there is even a box at all. Most of Nunavik doesn't have any trees but there are a lot of land based dog sled routes where the front mounted box really helps in controlling the direction of the qamutik. Especially in the wooded areas of Kuujjuaq where there is soft deep snow right beside the trail and trees within that snow it is really helpful to be able to grab the antler handle and direct the qamutik back on the trail when it veers off. Some boxes have wooden handles that extend off the sides that also help with steering. The box closes with a beluga tooth toggle. The pups are now all approaching six months of age and I've been integrating one pup at a time with the adults while pulling since they hit the five month mark. There is much variation in opinion when it is deemed appropriate to put pups in harness and I am definitely on the less conservative side of this group. Essentially you don't want to damage the bones or joints of pups, nor do you want them to be over disciplined creating a negative experience. Early work in harness should always be fun and the pups should never be pushed to their limits. They shouldn't finish the run exhausted nor should they pull too much or pushed too fast. Every situation is unique and in our situation we need to keep the sled slow with some weight so the pups can keep up with the adults. Even though the qamutik is weighted the pups aren't doing grunt work as they leave that up to the adults. This is an instance where the fan hitch really has an advantage as it is easy to monitor the pups individually. In general three to five hour runs with pups at this age should be fine, but individual dogs vary and need to be monitored. Your pups will tell you when to call it quits if you are willing to listen. The load it took to keep the adults at a reasonable speed for the pups. There is a one year old in that amautik too. With a close watchful eye and never ever alone.